1.2.2 Where are the SSL Certificate Files? 1.2.4 Verify your commercial certificate. Step by Step Wiki/KB article to install a Let's Encrypt Commercial Certificate. Disclaimer The Let’s Encrypt Client is BETA SOFTWARE. It contains plenty of bugs and rough edges, and it should be tested thoroughly in staging environments before use on production systems. For more information regarding the status of the project, please see https://letsencrypt.org. Be sure to check out the Frequently Asked Questions (FAQ). Let’s Encrypt is a new Certificate Authority: It’s free, automated, and open. It could be an option to protect Zimbra Servers with a valid SSL certificate; however, please be aware that is a Beta for now. Some stuff could not work or have issues, so use it at your own risk. 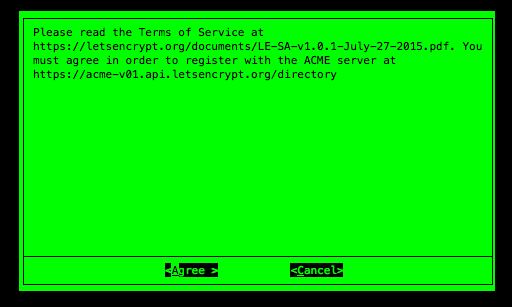 Let's Encrypt must be installed on one Linux machine to obtain the proper SSL Certificate, CA Intermediate, and Private Key. 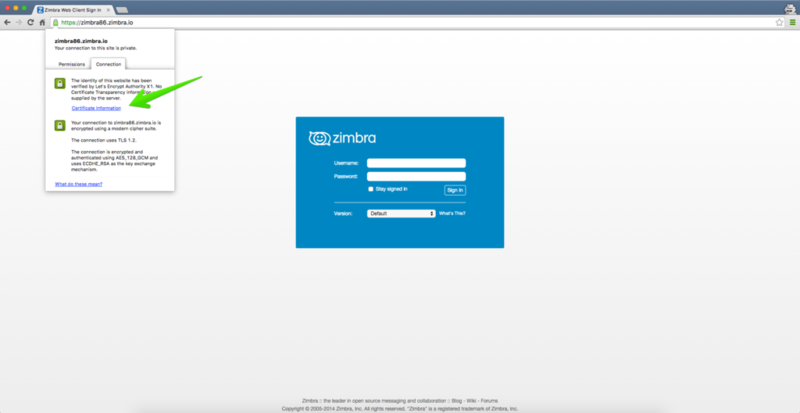 It is not required that it be on the same Zimbra Server, but it could save time and help to obtain the renewals, etc. Note: On RedHat/CentOS 6 you will need to enable the EPEL repository before install. 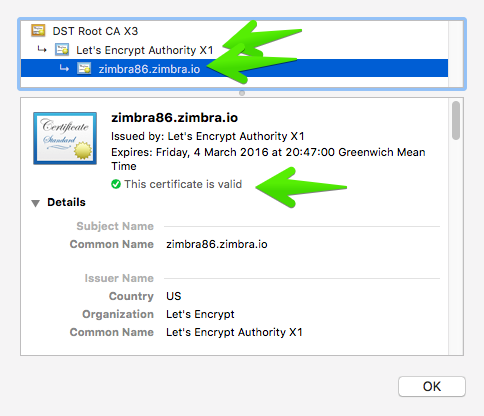 Let's now run Let's Encrypt in auto mode and use the certonly option, because for now the project can't automatically install the cert on Zimbra servers. Updating letsencrypt and virtual environment dependencies...../root/.local/share/letsencrypt/local/lib/python2.7/site-packages/pip/_vendor/requests/packages/urllib3/util/ssl_.py:90: InsecurePlatformWarning: A true SSLContext object is not available. This prevents urllib3 from configuring SSL appropriately and may cause certain SSL connections to fail. For more information, see https://urllib3.readthedocs.org/en/latest/security.html#insecureplatformwarning. ./root/.local/share/letsencrypt/local/lib/python2.7/site-packages/pip/_vendor/requests/packages/urllib3/util/ssl_.py:90: InsecurePlatformWarning: A true SSLContext object is not available. This prevents urllib3 from configuring SSL appropriately and may cause certain SSL connections to fail. For more information, see https://urllib3.readthedocs.org/en/latest/security.html#insecureplatformwarning. The process will ask for an Email Address in case of emergency contact or to recover the lost key. The process will ask if we agree with the ToS. In case we run a renewal, or a request for a new FQDN, the process will just take a few seconds. certificate in the future, simply run Let's Encrypt again. Where are the SSL Certificate Files? drwxr-xr-x 2 root root 4096 Dec  5 16:46 .
drwx------ 3 root root 4096 Dec  5 16:46 .. Please keep in mind that the private key is only for you. To sum up: chain.pem has to be concatened with the root CA. First the chain and the end of the file the root CA. The order is important. drwxr-xr-x 2 root   root   4096 Jul 15 22:59 .
drwxr-xr-x 8 zimbra zimbra 4096 Jul 15 22:59 .. Certificate (cert.pem) and private key (privkey.pem) match. Before deploying a good practice is to make a backup. Certificate 'cert.pem' and private key '/opt/zimbra/ssl/zimbra/commercial/commercial.key' match. ** NOTE: restart mailboxd to use the imported certificate. ** NOTE: restart services to use the new certificates. Certificate (cert.pem) and private key (/opt/zimbra/ssl/zimbra/commercial/commercial.key) match. ** Importing certificate /opt/zimbra/ssl/zimbra/commercial/commercial_ca.crt to CACERTS as zcs-user-commercial_ca...done. ** NOTE: mailboxd must be restarted in order to use the imported certificate. ** Saving server config key zimbraSSLCertificate...failed. ** Saving server config key zimbraSSLPrivateKey...failed. ** Installing mta certificate and key...done. ** Installing slapd certificate and key...done. ** Installing proxy certificate and key...done. ** Creating pkcs12 file /opt/zimbra/ssl/zimbra/jetty.pkcs12...done. ** Creating keystore file /opt/zimbra/mailboxd/etc/keystore...done. ** Installing CA to /opt/zimbra/conf/ca...done. You can do almost everything you need, like Subject Alt Names, different domains, etc. But to see more about this, visit the web of the official project. A warning will be issued 30 days before the expiration, a critical will be issued 14 days before the expiration.